So you interested in what it takes to build a pot still! With the right instructions and a bit of common sense it’s pretty easy to build your own still. I’ve been building stills for years now and like to think I’ve perfected my designs by now. In this article I’ll teach you how to build a very simple pot still. So simple in fact that anyone can do it at home with everyday items found in their kitchen. If your interested in learning how to build a more sophisticated Pot Still or Column/Reflux still visit learntomoonshine.com/category/how-to-make-a-still . First thing your going to need some materials to build your own still. Round the following up from your kitchen. Homemade Corn Mash or Sugar Mash or simply a bottle of wine if your wanting to keep things easy. Step 2 – Place the glass in the center of the Pot. Step 3 – Place the Magnet inside the glass this will hold it to the bottom of the pan so it stays in place when we start distilling. ( If you can think of a better way to do this have at er) Also make sure you use a clean magnet. Step 4 – Place the mixing bowl on top and add the weight to the bottom of the bowl and your done. You’ve made your first Pot Still see I told you that would be easy. I know your thinking it doesn’t look like but I’m sure your thirsty for some moonshine so let’s get on with distilling some. Step 1 – Add your corn or sugar wash to the pot. If your using wine to keep things simple add that * Note don’t add to much at one time! The Wash or Wine should be no higher then half the height of the glass. Step 4 – Now that your Wash is at 120 F reduce heat to med / low and continue heating the wash.
Watch the cooking thermometer it will slowly rise in temperature. Keep in mind Methyl alcohol evaporates at 148.5 F you don’t want to drink this so don’t start collecting until your temperature is above this. Ethyl alcohol (aka Moonshine) evaporates at 173 F and Water boils at 212 F. So will stop collecting before we get reach this temperature. If your going to be drinking this I highly recommend you read our Theory of distilling 101 section to fully understand the distilling process before you attempt this. 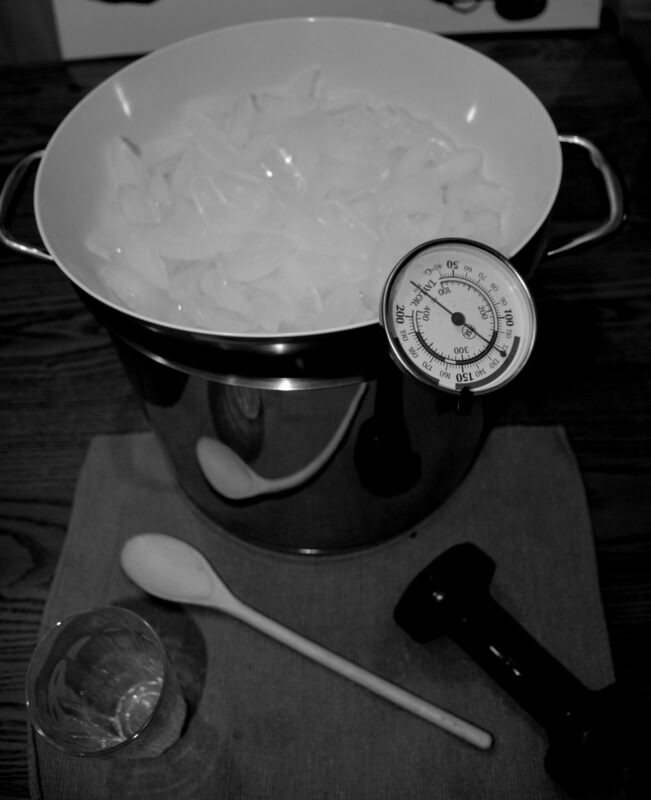 Step 4 – Once temperature has reached over 148.5 F Place mixing bowl with ice on top of pot to seal off any vapors escaping the pot. What’s going on inside your homemade Pot still is that as Ethyl Alcohol ( aka Moonshine) reaches it’s boiling point it is turning to a vapor. This vapor rises and then condenses on the bottom of the cold bowl. It then drips down into your glass giving you Moonshine!! Step 5 – As the temperature of your mash starts to approach 212 F remove the pot from the stove and let things cool down before removing the glass of Moonshine from the center of the Pot Still. You should have at least 3 to 4 ounces of Moonshine collected in your glass. Try testing it using one of the three Proofing test we discussed in Proofing Your Moonshine – 3 Easy Test . I’ve been able to hit 70 Proof or 35% abv with this set up. Check out these tutorials for more complex stills. 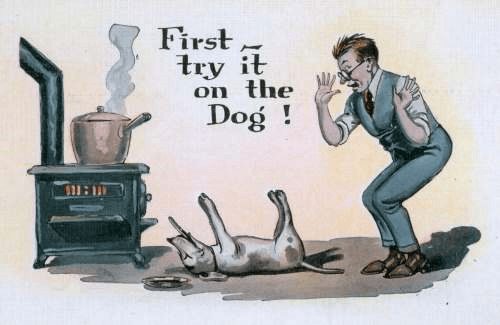 6 Responses to "How To Make A Simple Pot Still – Easy Step by Step Process"
When using this method do we still need to discard the first 100ml? Also, how do we know when we are done collecting? lol ya he would !! It’s a simple way to demonstrate the basic principles of distillation. Anyone serious about trying to make their own shine either check out these Still Plans or head over to http://homedistiller.org/forum/ everyone should join this forum! The real answer to this question is …it all depends on your mash. If your using a fruit mash aka wine etc. then there may be a little to discard but if using a simple sugar and yeast mash (which I highly recommend for this type of set up) then no don’t worry about it you are fine. Been distilling for years and this is what led me to the right track of fine distilling its a great experiment and yes you can easily produce a 65 to 80 proof aka 30 to 40 percent drink from this method. start simple by using a 2 liter Pepsi bottle filled 4 or 5 inches from the top with clean water I preferred filter but tap will do fine. Add a full teaspoon of yeast (don’t matter) and 13/4 cup of sugar. Keep top on loosely to allow air to escape squeeze to double check. then cover with coffee filter and a elastic. Let sit 7 to 10 days or until stop bubbling and then pour in your pot and start moon-shining. remember to keep your mash in warm dark area and to activate your yeast before adding to your sugar wash. Then when you are successful at this, and you will be, go build a real still and join the gang.